William Cox Cochran (1848-1936) was an Ohio lawyer, scholar, and trustee of Oberlin College. He served in the Department of the Interior in Washington under his stepfather, Jacob D. Cox. In 1872, after a European tour, Cochran studied law and opened a law office in Cincinnati. Later, he served as clerk of the U.S. Circuit Court of Appeals in Cincinnati. He died at the age of 88. William Cox Cochran captured these 89 images of East Tennessee during August 12 thru 30, 1886. 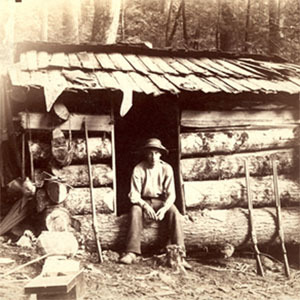 The photographs are of East Tennessee people and landmarks, mostly located in what is now the Great Smoky Mountains National Park. There are many photographs of Chilhowee Range, Nebo Mountain, and Miller's Cove. The collection includes two photographs of the University of Tennessee-Knoxville. The photographic images in the collection were donated by Miss Mary Rudd Cochran, daughter of W.C. Cochran to the University of Tennessee Library in 1959. Oberlin College has a collection of Cochran Family Papers that contain other photographs taken by William C. Cochran.